VIZ Media Announces "Tokyo Ghoul Complete Box Set"
Ken Kaneki was a shy, ordinary college student who attended Kamii University. There, he studied in the Department of Literature, specializing in Japanese literature. This book-loving freshman was excited to go on a date with the beautiful Rize Kamishiro, but he didn't know that she was a Ghoul. They look like humans and live among us, but Ghouls crave human flesh. Soon, Kaneki would find himself a hybrid, trapped between the worlds of Ghouls and humans. In Tokyo Ghoul, Vol. 6 (Chapters 49 to 58), Kaneki has an explosive encounter with Aogiri Tree, which is essentially a Ghoul gang organization. Kidnapped and trapped at Aogiri Tree's slum headquarters, Kaneki meets a dissident group within the organization, and the members want him to join their attempt to escape. Meanwhile, Juzo Suzuya, a member of CCG (Ghoul investigators), learns the secrets of Ghoul weapons, Kagune and Quinques. THE LOWDOWN: The Tokyo Ghoul manga stands among the countless works of fiction that take us to shadowy other-worlds that exist right along side the human world. To work as something a reader can grasp, such a work of fiction must be familiar, in that it has a frame of reference grounded in the reader's “real world,” so that the fictional world may be recognizable. To succeed or at least stand out, that other-world should be unique or novel. Tokyo Ghoul Volume 6 exemplifies how creator Sui Ishida deftly frames a real-world scenario via her “ordinary” lead character, Ken Kaneki. He is the kind of character that is likable, but that is also kind of a blank slate. Through him and upon him, a writer can tell any kind of wild story, and Kaneki is in the middle of a wild story. The monsters of this series' shadowy world resemble numerous boogeyman types to some extent. They are part vampire, werewolf, cannibal, zombie, shape-shifter, serial killer, and mass murderer. Ghouls are so patchwork that it is hard not to be intrigued by them or at least curious about their world. I think Tokyo Ghoul can run on curiosity for quite a while. 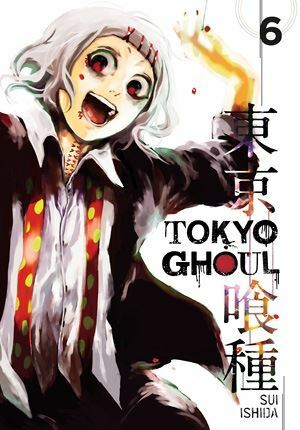 POSSIBLE AUDIENCE: Fans looking for a different kind of monster comic will want to taste VIZ Signature's Tokyo Ghoul.